Homologous recombination is the process by which nearly all domains of life repair genomic damage, specifically double strand breaks. Researchers have long taken advantage of this natural process to integrate protein tags into the genomes of S. cerevisiae and S. pombe. The protocol is surprisingly simple, requiring only a PCR product containing the modifying sequence flanked by approximately 50 base pairs of sequence homologous to the chromosomal site of insertion. The linear PCR product is introduced into the cell by direct transformation. A given insert will typically contain both a protein modification sequence and a selectable gene product for isolation of successful transformants. Addgene distributes several ready-to-use, modular plasmids, combining fluorescent tags, epitope tags, protease sites, and selection markers. These are especially useful in protein complex studies where tagging of multiple protein products is desired, as multiple selection markers can ensure that all desired tags have been integrated. Simply design your amplification primers with the desired targeting homology—in frame, of course—and start tagging! Lee S, et al. (2013) PLoS ONE 8(7): e67902. Many imaging studies rely on direct fusion of fluorescent proteins (FPs) to a yeast gene of interest. These fluorescently tagged genes are expressed under native conditions and allow scientists to not only track the abundance, movement, and localization of individual proteins, but also investigate protein-protein interactions via FRET. 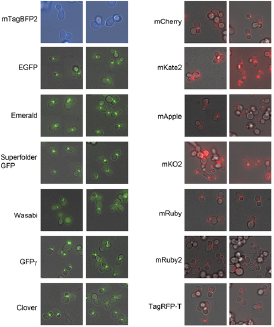 Sidae Lee, Wendell Lim, and Kurt Thorn at UCSF have recently developed a series of blue, green, and red FPs that are codon optimized specifically for expression in yeast. These tagging vectors are based on previously described pFA6a-link vectors and include a Kan, SpHIS5, or CaURA3 selection marker. Lee et al. (1) assessed many of these fluorescent tags in S. cerevisiae, looking at their performance in categories such as brightness, stability, and disruption of the tagged protein. 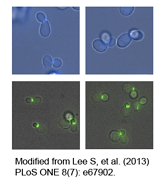 Based on their findings, the authors recommend optimal FP combinations for use in yeast imaging, categorized by specific filter sets and experimental output requirements. Select from these yeast-optimized fluorophore tagging vectors for your single or multi-color imaging experiments. If you're looking for a great resource about imaging techniques, check out Kurt Thorn's microscopy blog. Others may be interested in attaching epitope tags to their genes of interest, allowing for easy capture and detection of proteins and complexes, without the artifacts sometimes associated with plasmid-based overexpression. Tim Formosa, at the University of Utah, has built a complete collection of yeast tagging modules with each possible combination of protease site (TEV or PreScission), epitope tag (12xHis, 2xStrep, 3xFlag, Protein A, or V5), and selection marker (KanMX, HphMX, or His3MX). Each PCR product from this collection will yield an insert with the format (protease site)-6xGly linker-(epitope tag)-ADH1 terminator-(selection marker). Additionally, Dr. Formosa has deposited six plasmids with a multiple cloning site in place of the epitope tag for creation of your own unique protein fusions. This collection is ideal for tandem affinity purification of protein complexes. John Pringle and Jürg Bähler have deposited a large collection of plasmids for genome modification in yeast developed by Dr. Pringle’s former lab at UNC Chapel Hill. Bähler et al. (2) describe a modular collection of plasmids for a wide variety of genome modifications in S. Pombe, including full and partial gene deletion, overexpression (by promoter substitution), and tagging at either the N- or C-terminus (3xHA, 13xMyc, GST, or GFP). Longtine et al. (3) describe a complimentary set of plasmids for use in S. cerevisiae, with the additional benefit of multiple selection markers for combining modifications within a single strain. In addition to the collections featured above, many other modular yeast tagging systems have been developed in the labs of Anne Robinson, Eishi Noguchi, and Melissa Moore, to name a few. Have you used these tools in your own lab? Addgene would love to hear from you, our community, about your experience with yeast genome modifications. In what ways have genome tagging systems enabled you to advance your research? Do you have a favorite tagging system that isn't mentioned here? Lee S, Lim WA, Thorn KS. PLoS One. 2013 Jul 2;8(7):e67902. Bähler J, Wu JQ, Longtine MS, Shah NG, McKenzie A 3rd, Steever AB, Wach A, Philippsen P, Pringle JR. Yeast. 1998 Jul;14(10):943-51. Longtine MS, McKenzie A 3rd, Demarini DJ, Shah NG, Wach A, Brachat A, Philippsen P, Pringle JR. Yeast. 1998 Jul;14(10):953-61. Note: Marcy Patrick contributed to the writing of this article.